Senate Majority Leader Mitch McConnell says Republicans are getting ready for votes on legislation scuttling former President Barack Obama's health care law. His comments Tuesday came amid growing indications that the climactic vote could occur next week. "The Senate will soon have a chance to turn the page on this failed law," said the Kentucky Republican. He said GOP senators have had "many productive discussions" on the measure and added, "We have to act, and we are." On MSNBC's "Morning Joe," Sen. Bob Corker, R-Tenn., said GOP senators will be briefed on the emerging bill Wednesday and he expects to see the legislation the next day, about a week before a vote occurs. Even so, lobbyists said final decisions had yet to be made on some issues. Democrats don't have enough votes to stop the still-evolving Senate Republican health care bill. But they're criticizing it as a stealth measure that GOP leaders want to rush through the chamber before anyone knows what's really in it. 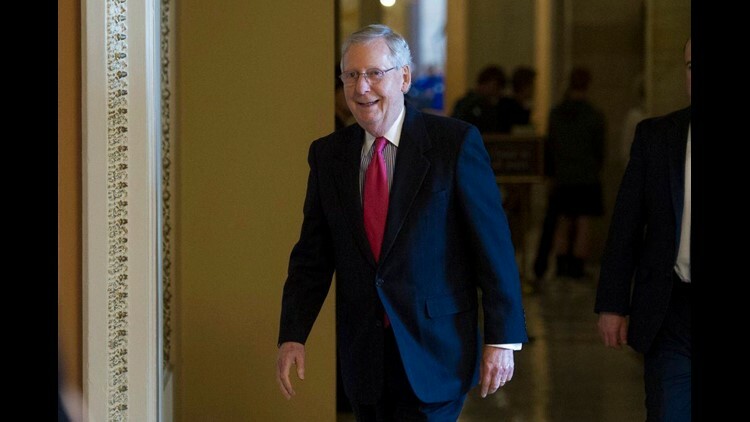 Senate Majority Leader Mitch McConnell will have none of it. The Kentucky Republican says former President Barack Obama's health care law has been failing since its 2010 enactment and there's no reason to wait to erase it. He's hoping for Senate approval next week. Democrats held the Senate floor for several hours late Monday and promised to use procedural tactics to slow the Senate's work, to focus attention on the Republican effort. They say the closed-door, Republicans-only meetings McConnell is using to write the bill is an insult to voters.